Montanans care deeply about the well being of their families and communities. They want a hopeful and prosperous future for their children and neighbors, safe communities, and a strong state economy that supports quality jobs and thriving businesses. As Montanans, we have come together at many pivotal moments in our state’s history to collectively build toward these goals. Together, we have considered not only what we can afford to accomplish today, but also the investments we must make to protect our future. During Montana’s 2017 legislative session, elected officials should be focused on wisely increasing and using the state’s resources to help build opportunities and a path to prosperity for all Montanans through the budget creation process. A recent, but short-term, decline in state revenue, caused primarily by declines in corporate income and oil and natural gas taxes and slower than anticipated growth in individual income taxes, has created significant challenges for the state’s elected officials. The proposed executive budget creates a responsible blueprint for addressing these challenges through a balanced approach that includes a combination of difficult cuts and targeted revenue enhancers that bring more tax fairness to our system and ensure adequate levels of revenue. Unfortunately, key legislative leaders have indicated a dangerous unwillingness to accept this balanced approach and have instead started the budget process by imposing additional deep, unnecessary, and harmful cuts. Recent revenue declines are threatening Montana’s ability to adequately invest in the public structures and services that educate our children, keep our communities safe, protect our land and water, and provide health care and other services when Montanans struggle to make ends meet. Revenue for the current 2017 biennium is expected to be roughly $300 million lower than the 2015 Legislature anticipated. At the conclusion of the 2017 budget cycle, the ending general fund balance is expected to be $79 million, or $236 million less than was projected in 2015. In general, that reduction must be made up with some combination of budget cuts, revenue enhancers, or fund transfers. Before every legislative session, the governor proposes a budget for the next biennium based on projected revenue estimates for the same period. That executive budget is evaluated by the legislature’s staff before the session and serves as a starting point for legislative changes to the budget. The governor’s proposed budget for the 2019 biennium includes a package of budget cuts, revenue enhancers, and fund transfers. $109 million ($74 million in HB 2) in general fund cuts from what would have been a present law budget. In House Bill 2 alone, the executive budget assumes total fund reductions exceeding $346 million, which includes $55 million in reductions to state special revenue funding and $217 million in lost federal matching funds. The loss of federal funds occur within the Montana Department of Transportation (MDT) and Montana Department of Public Health and Human Services (DPHHS). $77 million in new expenditures ($38 million included in HB 2). New proposals include, for example, funding for early education, youth suicide prevention, state employee pay plan increases of 1% per year, and increased funding for area agencies on aging. $156 million in new revenue ($123 million in general fund revenue), most of which comes through increasing taxes on Montana’s highest income earners. See Appendix A for a list of new revenue sources. $7 million in revenue reductions, including $5 million for a state earned income credit for working low-income families in Montana. $83 million in one-time-only transfers from state special revenue funds into the general fund, including $56 million from infrastructure funds that the executive would replace with bonding. $55 million in general fund savings by funding certain programs from state special revenue that previously have been funded by general fund dollars. For example, funding for some Medicaid caseload and mental health services would be switched from general fund to tobacco tax and wine tax state special revenue accounts respectively. Increases in those consumption taxes would fund the switch. A general fund ending fund balance of $300 million for the 2019 biennium. Because the state does not have a constitutionally or statutorily required “rainy day fund,” the ending fund balance is the only mechanism for dealing with revenue uncertainty or volatility between legislative sessions. Note that without the executive’s proposed revenue enhancements, roughly $156 million in additional general fund cuts from the proposed budget would be necessary to achieve a $300 million ending fund balance for the 2019 biennium. Both the Montana Senate and House have committees dedicated to reviewing, changing, and voting on House Bill 2 and other appropriations bills before the bills go to the floors of their respective chambers. Those committees are the Senate Finance and Claims Committee and the House Appropriations Committee. At the beginning of each session, budget subcommittees with representatives of both committees are formed to look closely at each of the main areas of the budget and make preliminary decisions about what should be added, cut, or moved from the governor’s proposed budget. This year, majority leadership directed each of the subcommittees to both accept the governor’s proposed reductions and make further reductions of over $40 million in general fund cuts in the first set of motions taken on the budget. These cuts included reductions to nearly all agencies, including an additional 2% “vacancy savings.” In the budgeting process, elected officials and their analysts tend to pay particular attention to the state general fund. The general fund is the state’s primary and most flexible funding source, and it is the fund for which both structural balance and adequate ending fund balances are targeted by governors and legislators alike. Targets for starting points by the joint appropriation subcommittees were focused entirely on general fund and state special revenue spending, but in the Department of Public Health and Human Services (DPHHS) and Department of Transportation (DOT) budgets, the effects of those cuts are magnified by even larger losses of federal matching funds. Across all agencies, additional legislative reductions in general fund result in over $102 million in total funding cuts beyond what was proposed in the executive budget. In total, the early motions adopted by the joint appropriation subcommittees have resulted in a starting point for House Bill 2 that is over $449 million below the 2017 base budget in total funds, including over $114 million in general funds and $254 million in federal funds. See Appendix B for a preliminary analysis of the cuts taken by the joint appropriation subcommittees. Over $93 million in reductions to DPHHS, with the largest portion of those reductions occurring in the Senior and Long Term Care Division, which administers Medicaid benefits and other services to seniors and people with disabilities who need assistance staying in their own home or reside in a nursing home. Over $23 million in cuts to Montana’s college and university system, including reductions to state support of community colleges by over $2 million and to UM and MSU schools by over $16 million. Representatives of the Office of the Commissioner of Higher Education have indicated that if the cuts to state support remain in the budget, students could face “double-digit” tuition rate increases as well as cuts to university programs and student services. A loss of $193 million in federal funds because of insufficient funding in the state special revenue account that funds Department of Transportation projects eligible for significant federal matching dollars. This funding is used to support construction and maintenance of roads, highways, and bridges, the Montana Highway Patrol, and other programs within the Departments of Justice and Fish Wildlife and Parks. One option for restoring the federal funding is to increase the gas tax that funds the highway state special revenue account used to match the federal dollars available. Such an increase was not proposed in the executive budget but is being discussed and considered. $3.4 million in cuts to the Department of Corrections. Although the legislature has not specified where those cuts would be taken, representatives of the state agency have suggested that they may jeopardize staff and community safety. Over $22 million in reductions to state support for local K-12 schools throughout the state compared to what would have been provided under current Montana laws that dictate how much education funding should increase each year. Legislators on the budget subcommittees that adopted these starting motions have suggested that additional changes will be made and that some funding may be added back into the budget before the legislative session ends. However, the legislature cannot restore cuts and rebuild the ending fund balance without finding additional revenue, either through the governor’s proposed revenue raisers, alternative proposals, and/or by adopting new revenue projections with higher estimates. Any new spending or continuation of priorities previously funded as one-time-only appropriations would also require corresponding cuts or increased revenue. In the budget creation process, most appropriations are designated as ongoing expenditures, meaning that the legislature and executive assume they will continue to be funded beyond the next biennium. Those ongoing appropriations are used to create the next base budget. The preliminary reductions discussed above are cuts to that base budget. Some of the OTO expenditures are included in the governor’s proposed budget as new proposals. Those new proposals would need to be adopted by the legislature in order to be included in the 2019 budget. In general, any continuation of OTO funding would need to be funded with a corresponding cut in another area of the budget or the adoption of new revenue. With few exceptions, the joint appropriations subcommittees have not yet adopted present law adjustments included in the governor’s budget. Present law adjustments are the funding changes needed “under present law to allow maintenance of operations and services at the level authorized by the previous legislature.” Some present law adjustments are statutorily required increases based on funding formulas and inflationary or deflationary adjustments. As a result, the effects of present law adjustments vary widely in the governor’s proposed budget and, if adopted, will either increase or further decrease the funding compared to the base budget. For example, within the budget for the Office of Public Instruction (OPI), present law adjustments for local assistance to K-12 schools represents an increase of approximately $73 million in total funds. Even factoring in the reductions within the starting point motions, the OPI budget would increase by approximately $49 million. Other state agencies are facing present law adjustments that represent reductions from the amount appropriated in 2017 biennium. For example, agencies such as the Department of Commerce and Department of Labor & Industry are experiencing negative present law adjustments. While the Department of Public Health and Human Services sees an overall net positive within its present law adjustments, some divisions within the agency are facing reductions. For example, the present law adjustments to the Senior and Long-Term Care Division of DPHHS would further reduce that budget by approximately $26 million in total funds. If acted upon, this adjustment would come in on top of the over $52 million in cuts already taken in the starting point motion adopted by the Joint Subcommittee for Health and Human Services Appropriations. The early cuts to the public programs that help make our communities safe, healthy, and educated are as unnecessary as they are damaging. These cuts will have potentially devastating impacts on students, vulnerable Montanans, and communities across the state. Our elected leaders have other choices available, including passing a number of sensible bills that would increase state revenues by closing tax loopholes and making sure that all taxpayers pay their fair share. Building long-term and widely shared prosperity in our communities, providing adequate services for Montana’s seniors and people with disabilities, and ensuring opportunity for all Montana’s students, will require a willingness to entertain a balanced approach to the state’s current revenue challenges. Matt Volz. “AP Explains: Why Budget Tops Montana Legislature’s Agenda.” Daily Interlake. January 6, 2017. http://www.dailyinterlake.com/article/20170106/AP/301069909. Montana Legislative Fiscal Division, Vol. 1 Statewide Perspectives, “Legislative Budget Analysis: 2019 Biennium,” p. 3. See generally, Legislative Fiscal Division. “Legislative Budget Analysis: 2019 Biennium Budget” January 2017. http://leg.mt.gov/content/Publications/fiscal/Budget-Books/2019/fiscal-publications.asp. The budget includes House Bill 2 (HB 2) that is the primary legislative vehicle for passing the two-year budget. The budget also includes smaller budget bills, including “cat and dog” bills, which include appropriations by creating or amending a program in state law. Unless noted separately, all estimates are from Legislative Fiscal Division. “Legislative Budget Analysis: 2019 Biennium Budget” January 2017. http://leg.mt.gov/content/Publications/fiscal/Budget-Books/2019/fiscal-publications.asp. 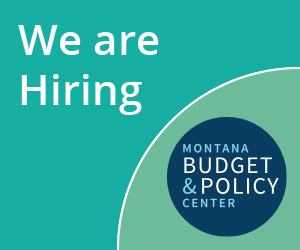 For more information on the creation of a state EITC, see: Montana Budget and Policy Center. “Investing in Montana’s Working Families: A Montana Earned Income Tax Credit.” September 2016. http://www.montanabudget.org/2016_eitc/. For a list of the subcommittees and their schedules, go to the Legislative Fiscal Division website and scroll down to “Joint Appropriations Subcommittee Schedules.” http://leg.mt.gov/css/fiscal/reports/2017-Session.asp. Memo from Sen. Llew Jones and Rep. Nancy Balance to HB 2 Subcommittee Chairs. 65th Legislature. December 20, 2016. http://leg.mt.gov/content/Publications/fiscal/2017 Session/Committee-chairs-memo.pdf. 4% vacancy savings are already assumed in the executive proposed budget. Montana Legislative Fiscal Division, Vol. 1 Statewide Perspectives, “Legislative Budget Analysis: 2019 Biennium,” p. 54. Approximately $193 million of the lost federal funds are the result of an insufficient fund balance in the Highway State Special Revenue Account. The downward adjustment of that state special revenue account makes up $42.8 million of the special revenue reductions represented in the governor’s proposed budget. The remaining reduction in federal matching funds, approximately $24.5 million, comes entirely from the Department of Public Health and Human Services (DPHHS) budget. MBPC calculations in Appendix B are based on starting point motion summaries produced by the Legislative Fiscal Division staff for each appropriations subcommittee, on file with MBPC. The data and calculations are preliminary and may change as legislative staff corrects or adjusts the underlying data. This estimate does not reflect a modification to the starting point motion taken by the Subcommittee on January 24, 2017, which made two adjustments. DP-50 reduction to Program 09 (appropriation distribution to MUS units) was further reduced by $1,903,274 in general fund, and the DP-50 reduction to Program 10 (research and development agencies) was further reduced by $24,894 in general fund. Legislative Fiscal Division. “Motion OCHE–2A.” January 24, 2017. On file with MBPC. Charles Johnson. “Legislative subcommittees begin cutting millions to education and corrections.” Bozeman Daily Chronicle. January 11, 2017. http://www.bozemandailychronicle.com/news/mtleg/legislative-subcommittees-begin-cutting-millions-to-education-and-corrections/article_d832a7e2-2b28-59a5-bcd2-9fb8fc5bb669.html. According to the Legislative Fiscal Division, “For the past five years, expenditures in the restricted highway state special revenue account (HSRA) have exceeded the revenue flowing into the fund. As a result, the fund balance in HSRA has declined to a point where MDT is experiencing serious cash flow issues…. HSRA cannot continue to support the ongoing costs, current service levels, maintenance of effort needed to retain the state’s favorable federal match rate, and the match to federal construction without changes.” Legislative Fiscal Division. “Volume 5: Section C - Natural Resource and Transportation.” Legislative Budget Analysis: 2019 Biennium. November 2016. http://leg.mt.gov/content/Publications/fiscal/Budget-Books/2019/Budget-Analysis/section_c/00-Entire-Sec-C.pdf. Jonathon Ambarian. “Montana highway projects move forward after $10M loan.” MTN News. January 13, 2017. http://www.kxlh.com/story/34255900/montana-highway-projects-move-forward-after-10m-loan. See “Present Law Adjustments Will Affect Agencies Differently,” below. Matt Volz. “Lawmakers propose slashing Montana health department budget by $93M.” Great Falls Tribune. January 11, 2017. http://www.greatfallstribune.com/story/news/politics/2017/01/11/lawmakers-propose-slashing-montana-health-department-budget/96459494/. The one-time-only designation is sometimes made because the legislature wants to receive updates and reports before deciding whether to continue funding. Sometimes the designation is made in order to achieve structural balance in the budget, so that ongoing expenditures do not exceed ongoing revenue. Legislative Fiscal Division. “Legislative Fiscal Report 2017 Biennium: Volume 1, Statewide Perspectives.” June 2015. http://leg.mt.gov/content/Publications/fiscal/Budget-Books/2017/Fiscal-Report/Volume-1/4.pdf. The $69 million does not include the funding for OPD and Livestock, agencies whose entire budgets were designated as OTO in the 2017 biennial budget. Legislative Fiscal Division. “Legislative Fiscal Report 2017 Biennium: Volume 1, Statewide Perspectives.” June 2015. http://leg.mt.gov/content/Publications/fiscal/Budget-Books/2017/Fiscal-Report/Volume-1/4.pdf. Legislative Fiscal Division. “Understanding State Finances and the Budgeting Process.” 2017 Legislative Session. http://leg.mt.gov/content/Publications/fiscal/leg_reference/Brochures/understanding-state-finances.pdf. Legislative Fiscal Division. “Office of Public Instruction: An Agency Profile Prepared by the Legislative Fiscal Division.” November 2016. http://leg.mt.gov/content/Publications/fiscal/Budget-Books/2019/Budget-Analysis/section_e/00-Entire-Sec-E.pdf. Legislative Fiscal Division. “General Government: An Agency Profile Prepared by the Legislative Fiscal Division.” November 2016. http://leg.mt.gov/content/Publications/fiscal/Budget-Books/2019/Budget-Analysis/section_a/00-Entire-Sec-A.pdf. Legislative Fiscal Division. “The Department of Public Health and Human Services: An Agency Profile Prepared by the Legislative Fiscal Division.” November 201.6 http://leg.mt.gov/content/Publications/fiscal/Budget-Books/2019/Budget-Analysis/section_b/00-Entire-Sec-B.pdf. In the joint appropriation subcommittee hearing, DPHHS has claimed that the present law adjustment taken to the SLTC budget reflects that services provided in that division are under-utilized under current law. Base budget – The level of ongoing appropriations from the most recent fiscal year from which the executive and legislature make upward or downward adjustments in building the next biennium’s budget. Biennium – A two-year period. For the state budget, this period begins July 1 of the odd-numbered years and ends June 30 of the following odd-numbered year. Biennium budget – The total amount of appropriations for a two-year period, including one-time only appropriations. Budget – The total amount of appropriations for a given year, including one-time only appropriations. Cat and dog bills – One-time or on-going appropriations made in bills other than the General Appropriations Act (HB 2). Decision package (also called a change package) – Separate, specific adjustments to the base budget. Change packages can be either present law adjustments or new proposals. 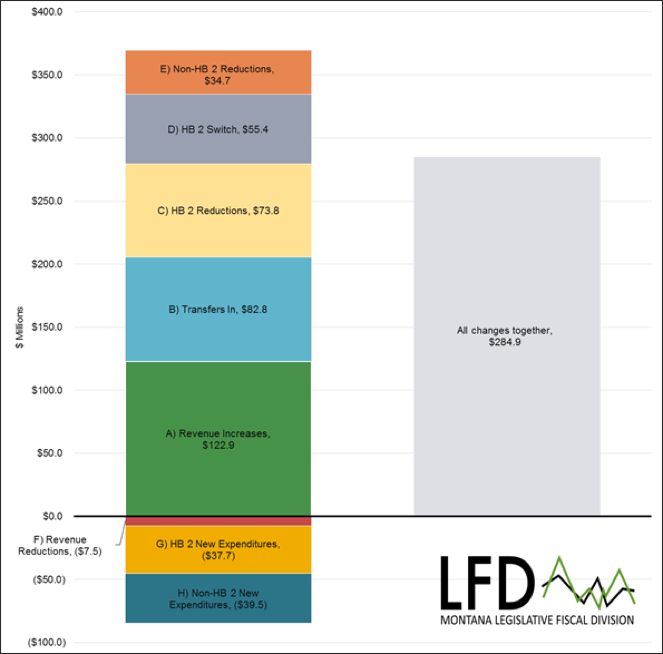 Ending fund balance – The amount of funds remaining in the Montana budget after the end of a fiscal year or biennial budget. Montana is one of only four states in the country that does not have a separate “rainy day fund” to protect against recessions or other unforeseen events. Instead, Montana relies on the budget’s ending fund balance to help the state through fiscally tough times or emergencies. Executive budget ­– The proposed budget developed by the Governor for the upcoming fiscal biennium. Federal special revenue – Accounts deposited in the state treasury from federal sources, to be used for the operation of state government. Fiscal year (FY) or state fiscal year (SFY) – A 12-month accounting period beginning July 1 and ending June 30. FY 2017 refers to the fiscal year ending June 30, 2017. (Note: The federal fiscal year (FFY) is October 1 through September 30. General fund – Accounts for all governmental financial resources except those that must be accounted for in another fund. HB 2 – The General Appropriations Act in which the legislature authorize the funding for the operation of state government for the upcoming biennium. Each session, House Bill 2 is reserved for this purpose. New proposals – Requests (change packages or decision packages) to provide new non-mandated services, to change program services, to eliminate existing services, or to change the source of funds. Non-budgeted transfer – Funds moved from one account to another in the state accounting system based upon statutory authority but not by appropriation in the General Appropriations Act (HB 2). Pay plan – Provision by the legislature of a general adjustment to salaries and/or benefits paid to state employees. Also refers to the pay schedule listing the state salary rate for each classified position according to that position’s grade and the market rate. Present law – The additional or reduced level of funding needed under the present law to maintain ongoing operations and services at the level authorized by the previous legislature. Present law adjustments – Requests (change packages or decision packages) for an adjustment in funding sufficient to allow maintenance of operations and services at the level authorized by the previous legislature (e.g., caseload, enrollment changes, and legally mandated workload). Proprietary Funds – Funds that account for operations financed and operated in a manner similar to private business (enterprise funds) or provided by one department/agency to another department/agency (internal service funds). State Special Revenue – Accounts for money from state and other nonfederal sources that is earmarked for a particular purpose, as well as money from other non-state or nonfederal sources that is restricted by law or by the terms of an agreement. Vacancy Savings – The difference between what agencies actually spend for personal services and the cost of fully funded positions for the entire year. Also the rate that may be established by the legislature to reduce personal services budgets. *Most of these terms, along with additional terms, can be found at Montana Legislative Fiscal Division, “Understanding State Finances and the Budget Process.” 2017 Legislative Session. http://leg.mt.gov/content/Publications/fiscal/leg_reference/Brochures/understanding-state-finances.pdf. Supporting information can be found in two supporting documents.